Abstract: A 73-year-old man with no significant past medical history or any history of health care visits was hospitalized for pneumonia. 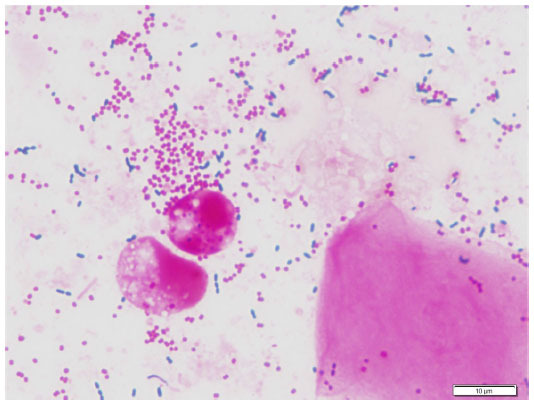 Sputum culture revealed multidrug-resistant Streptococcus pneumoniae, even to carbapenems. The patient was later treated successfully with levofloxacin. Throat cultures from his two grandchildren revealed S. pneumoniae with the same susceptibility pattern. Analysis for resistant genes revealed gPRSP (pbp1a + pbp2x + pbp2b gene variants) in both the patient and his grandchildren, none of whom had received pneumococcal vaccines of any kind. This case illustrates the importance of the emergence of carbapenem-resistant S. pneumoniae. Non-rational use of carbapenems for community-acquired infections may be counterproductive. This case also highlights the importance of pneumococcal vaccinations in children and the elderly. Carbapenems are often used to treat severe infections, but this choice might not necessarily be a reasonable one. Automatic, knee-jerk use of carbapenem for sick patients might potentially lead to treatment failure. We cared for a patient with community-acquired pneumonia (CAP) caused by carbapenem-resistant Streptococcus pneumoniae. The organism was presumed to be transmitted by one of his grandchildren. Neither the patient nor his grandchildren had ever received pneumococcal vaccination. We herein report this case and discuss rational use of carbapenems for community-acquired infections and the importance of pneumococcal vaccines when indicated. A 73-year-old man without any significant past medical history presented with 10 days of cough and dyspnea, accompanied by loss of appetite. Dyspnea worsened gradually, with the patient becoming unable to walk to the bathroom, so he was brought to the hospital by ambulance. He denied any significant past medical history or family history, and was not on any medication. He even denied any previous attendances for health care. He had smoked one pack of cigarettes per day for 53 years. He also drank one can of beer and two 180 mL bottles of Japanese sake daily. He lived with his wife, and his son lived nearby. Upon arrival, he appeared sick and looked to be in pain. Blood pressure was 113/50 mmHg, pulse rate was 135 per minute, respiratory rate was 27 per minute, temperature was 37.8°C, and oxygen saturation level was 93% on room air. Examination of his head, eyes, ears, nose, and throat was unremarkable. His neck was supple. Cardiac auscultation revealed tachycardia but no murmur. A coarse crackle was heard in the right lower lung. The rest of his physical examination was unremarkable. Blood tests showed elevated white cells (33,200 per μL), lactate dehydrogenase 1,340 IU/L, and creatinine 2.5 mg/dL. Arterial blood gas (on oxygen of unknown amount) showed a pH of 7.347, pCO2 31.1 mmHg, pO2 53.3 mmHg, HCO3− 16.6 mEq/L, an anion gap of 17 mEq/L, and a delta anion gap of 5 mEq/L. Chest radiography showed infiltration in the lower lobes bilaterally, particularly on the right (Figure 1). 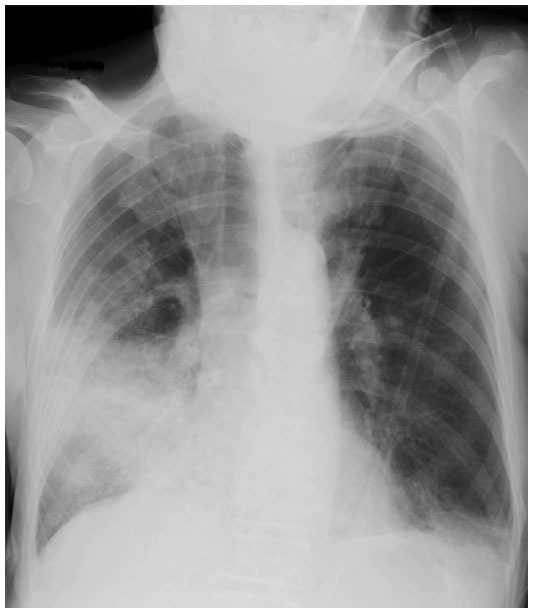 Figure 1 Chest radiograph on day of admission. Based on his history, physical examination, and laboratory findings, a diagnosis of severe pneumonia was made, with a score of 3 on the CURB-65 (British Thoracic Society Community Acquired Pneumonia Severity Calculations and Guidelines) and a score of V on the Pneumonia Severity Index. He was admitted to the intensive care unit, but did not require mechanical ventilation. Sputum staining showed many Gram-positive diplococci, suggesting that S. pneumoniae was the organism causing his pneumonia (Geckler’s category 5 with unknown Millar-Jones classification, Figure 2). Retrospectively, Gram-negative cocci were also seen but were not detected on initial microscopic examination. Ceftriaxone 2 g once daily and azithromycin 500 mg once daily were administered, both intravenously. Figure 2 Gram stain of sputum on day of admission. On the following day, his respiratory function deteriorated. He was intubated and placed on mechanical ventilation that afternoon. Because Gram staining of aspirates from the lower respiratory tract revealed decreased organisms and his cardiac function remained good, acute respiratory distress syndrome or another complication such as congestive heart failure was suspected rather than worsening of pneumonia. However, because of the patient’s deteriorating condition, his antibiotics were changed to meropenem 1 g twice a day and levofloxacin 750 mg once a day both intravenously. On the third day after admission, his respiratory function remained unchanged. The inspired oxygen fraction was set at 1.0. Intravenous methylprednisolone 80 mg was added. He also developed atrial fibrillation and hypotension, which led to addition of diltiazem and noradrenaline. On the fourth day after admission, his respiratory function and blood pressure improved. His inspired oxygen fraction decreased to 0.65 and his vasopressor was discontinued. On the fifth day after admission, the sputum culture result on admission was reported, which revealed meropenem-resistant S. pneumoniae and Moraxella catarrhalis (Table 1). The M. catarrhalis was beta-lactamase-producing but detailed susceptibility testing was not done. Two sets of blood cultures were negative. Based on the susceptibility pattern of S. pneumoniae, meropenem was discontinued and only intravenous levofloxacin was continued. Abbreviations: MIC, minimum inhibitory concentration; S, sensitive; R, resistant; I, intermediate; NA, not applicable. Analysis for resistant genes revealed gPRSP (pbp1a + pbp2x + pbp2b gene variants) and the capsular antigen was 19F; this is included in both the 7-valent and 23-valent pneumococcal vaccines. Because it seemed unusual for a patient to have acquired such a resistant organism without a history of access to health care, a more detailed history was taken from the patient. Apparently his two grandchildren (aged 3 years and 2 months) visited his house 3 days prior to the onset of his symptoms, and the 3-year-old grandchild had cold symptoms at that time. Throat cultures from both of them revealed S. pneumoniae with the same susceptibility pattern, the same genes for development of resistance, and the same capsular antigen. It was postulated that transmission of S. pneumoniae to the patient occurred via one of his grandchildren. Neither the patient nor his grandchildren had received any type of pneumococcal vaccination. On day 9 after admission, the patient developed diarrhea. A stool Clostridium difficile toxin assay was positive, and levofloxacin was discontinued. He was treated with oral metronidazole. His pneumonia resolved promptly, but his hospitalization was complicated by status epilepticus, presumably due to metabolic encephalopathy, gastrointestinal bleeding, pleural effusion, and cardiac arrest on changing his endotracheal tube. The patient was discharged from the intensive care unit one month after admission, and transferred to another hospital 2 months later. S. pneumoniae is the most common cause of CAP. Recent Japanese data show that more than 30% of CAP is caused by S. pneumoniae,4 and the proportion is about the same in studies conducted abroad.5–7 Multiple organisms are detected in about 30% of patients with CAP,7 and it is possible that both organisms were causative organisms in our case. M. catarrhalis was also detected in our patient. In severe pneumonia, a β-lactam plus macrolide or fluoroquinolone antibiotic is recommended as empiric therapy. If organisms are seen on Gram staining and are suspected as being causative, antimicrobial therapy may be initiated targeting the presumed causative organisms. But if one is not confident in interpreting the findings on Gram staining, or patients are too sick, the use of broad spectrum antibiotics are usually justified. Having stated that, use of broad-spectrum carbapenem is not a guarantee for success, as shown in our case. Mechanisms of carbapenem resistance are considered to be the acquisition of resistance genes leading to stepwise alterations in penicillin-binding proteins (PBPs), resulting in decreased affinity of PBP1a, PBP2x, and PBP2b,8 but the details of the mechanism are not fully understood as yet. Unlike other β-lactams, such as penicillins and oral cephalosporins, carbapenem resistance is not easily selected for by exposure to carbapenem, explaining that it is not that frequently observed.9 Having stated this, carbapenem resistance is no longer a rarity. It is rather common in the Asia-Pacific region, where meropenem susceptibility is only 43% for S. pneumoniae.10 According to Japanese Nosocomial Infections Surveillance data, 6.1% of S. pneumoniae isolates detected in 2013 were resistant to meropenem.11 An antibiogram at our hospital in 2012 showed that the susceptibility of S. pneumoniae to penicillin and meropenem was 100% and 86.2%, respectively. Although it is difficult to acquire resistance by using carbapenems alone, it is important to avoid inappropriate use from the antimicrobial stewardship point of view and for prognostic reasons. In Japan, five carbapenems (imipenem/cilastatin, meropenem, doripenem, biapenem, and panipenem/betamipron) are available for intravenous use and one (tebipenem/pivoxil) is available for oral administration. Ertapenem is not available in Japan, and all available carbapenems have very similar characteristics. Our patient had no significant past medical history or indeed any history of health care visits, making acquisition of a multidrug-resistant organism fairly unlikely. This led to further history-taking, that identified the existence of two grandchildren, both of whom had the identical strain of S. pneumoniae, implicating them as the source of infection. The organism in our case had capsular antigen 19F, which is covered by the 23-valent pneumococcal vaccine for adults and the 7-valent vaccine for children. Our patient most likely acquired S. pneumoniae from one of his grandchildren. This might have been prevented by vaccination of the patient and/or his grandchildren, since both PPV23 and PCV7 could have covered the serotype. If pneumococcal vaccinations were more widely taken up by adults and children, such lengthy and problematic hospitalizations could be avoided. In conclusion, here we report a case of CAP caused by multidrug-resistant S. pneumoniae, including resistance to meropenem. Easy use of meropenem may lead to treatment failure since carbapenem resistance is not uncommon in Japan. Appropriate clinical assessment and judicious use of antibiotics are necessary. Improved vaccination programs and better use of antibiotics in Japan could prevent cases such as the one reported here. We are indebted to Professor Kimiko Ubukata and Dr Naoko Chiba for the resistance gene and serologic analysis of S. pneumoniae. Brar NK, Niederman MS. Management of community-acquired pneumonia: a review and update. Ther Adv Respir Dis. 2011;5:61–78. Fine MJ, Smith MA, Carson CA, et al. Prognosis and outcomes of patients with community-acquired pneumonia. A meta-analysis. JAMA. 1996;275:134–141. Mandell LA, Wunderink RG, Anzueto A, et al. Infectious Diseases Society of America/American Thoracic Society consensus guidelines on the management of community-acquired pneumonia in adults. Clin Infect Dis. 2007;44:S2–S27. Kohno S, Seki M, Watanabe A. Evaluation of an assessment system for the JRS 2005: A-DROP for the management of CAP in adults. Intern Med. 2011;50:1183–1191. Karalus NC, Cursons RT, Leng RA, et al. Community acquired pneumonia: aetiology and prognostic index evaluation. Thorax. 1991;46:413–418. Neill AM, Martin IR, Weir R, et al. Community acquired pneumonia: aetiology and usefulness of severity criteria on admission. Thorax. 1996;51:1010–1016. Lieberman D, Schlaeffer F, Boldur I, et al. Multiple pathogens in adult patients admitted with community-acquired pneumonia: a one year prospective study of 346 consecutive patients. Thorax. 1996;51:179–184. Van Bambeke F, Reinert RR, Appelbaum PC, Tulkens PM, Peetermans WE. Multidrug-resistant Streptococcus pneumoniae infections: current and future therapeutic options. Drugs. 2007;67:2355–2382. Clark CL, Kosowska-Shick K, Ednie LM, Appelbaum PC. 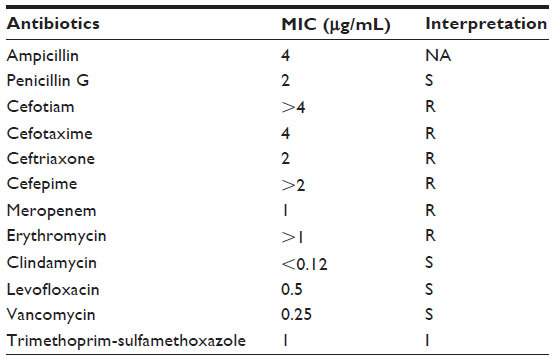 Capability of 11 antipneumococcal antibiotics to select for resistance by multistep and single-step methodologies. Antimicrob Agents Chemother. 2007;51:4196–4201. Brandon M, Dowzicky MJ. Antimicrobial susceptibility among Gram-positive organisms collected from pediatric patients globally between 2004 and 2011: results from the Tigecycline Evaluation and Surveillance Trial. J Clin Microbiol. 2013;51:2371–2378. Japan Nosocomial Infections Surveillance. [Data from Jul to Sep 2013]. Available from: http://www.nih-janis.jp/report/open_report/2013/2/1/ken_Open_Report_201303.pdf. Accessed April 21, 2014. Japanese. Infectious Diseases Society of America. Penicillin’s back: FDA raises breakpoints for S. pneumoniae pneumonia. April 1, 2008. Available from: http://news.idsociety.org/idsa/issues/2008-04-01/11.html. Accessed April 21, 2014. Roca A, Bottomley C, Hill PC, et al. Effect of age and vaccination with a pneumococcal conjugate vaccine on the density of pneumococcal nasopharyngeal carriage. Clin Infect Dis. 2012;55:816–824. Davis SM, Deloria-Knoll M, Kassa HT, O’Brien KL. Impact of pneumococcal conjugate vaccines on nasopharyngeal carriage and invasive disease among unvaccinated people: review of evidence on indirect effects. Vaccine. 2013;32:133–145. Ansaldi F, de Florentiis D, Canepa P, et al. Carriage of Streptoccoccus pneumoniae in healthy adults aged 60 years or over in a population with very high and long-lasting pneumococcal conjugate vaccine coverage in children: rationale and perspectives for PCV13 implementation. Hum Vaccin Immunother. 2013;9(3). Hsu KK, Shea KM, Stevenson AE, Pelton SI; Massachusetts Department of Public Health 2010. Changing serotypes causing childhood invasive pneumococcal disease: Massachusetts, 2001–2007. Pediatr Infect Dis. 2010;29:289–293. Kyaw MH, Lynfield R, Schaffner W, et al. Effect of introduction of the pneumococcal conjugate vaccine on drug-resistant Streptococcus pneumoniae. N Engl J Med. 2006;354:1455–1463.